We all know that mobile technology is growing at an exponentially great pace, and it is being adopted by most of the firms these days to amplify their business. Companies are stepping into the mobile field, and getting their apps made to modernize their business operations, in fact some of the firms are only reliant on the mobile app technology. Mobile apps do not only allow them to expand their business and reach out to more people but it also helps them to gain more revenue. But, this is about the mobile apps made for the customers or clients, have you ever wondered how enterprise mobility solutions help the company grow in terms of profit? The world has gone all mobile, we all have to accept that. Mobiles have become an indispensable part of business as well. However, the use of mobile technology is not limited to the customers. In fact, many companies have started adopting enterprise mobile technology at work to modernize and streamline their business operations. As, now a days office chores are not restricted to just working in the office building as the 9-5 job mentality is quickly fading away. In this era, employees have to work on the go as well in case the need arises. And, working on the go or after the office hours is not so convenient if the business strict to their old traditional way of working. And, as we know that mobility in corporate world is no longer only a topic of discussion, as many companies have already embraced it, and made it a part of their strategic agendas. A lot of companies have realized the importance and benefits of enterprise mobility. They know that thanks to the modern mobility solutions, the workers are now able to easily access their data, and do their work from any corner of the world. Plus, it is quite evident form the stats that the number of mobile users is only going to increase, therefore, even the companies who have yet not adopted the mobile technology might have to make use of it because of the changing dynamics. How does enterprise mobility lead to better growth of the business? 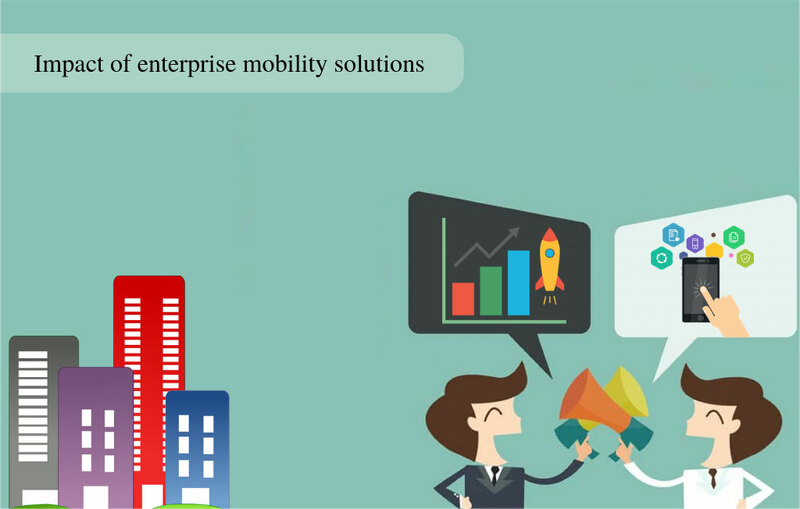 Enterprise mobility solutions have a major role to play when it comes to driving success of a business. Starting from enhancing the productivity of the employees to accomplishing the tasks in less time, there is a lot that the enterprise mobility solutions have offered to the corporate world. Better Communication:Enterprise solutions not only bridge the gap between the employees of the company, but they also enable the company to offer advanced customer service. It is a mandate for the organizations have to offer decent customer service to the consumers. And, the utilization of good solutions helps the service reps to easily access all the required corporate data from the mobile phone, and assist customers with instantaneous data. Better Efficiency and Reduced Costs: Whether the company is using a standard mobile for employees, or the employees are using their own mobile phones, in both the cases, the work is going to be smoother as everyone is well aware of the functionality of a mobile phone. At the same time, working on a known device will eventually lead to more efficiency. And, this technology also helps to reduce the costs of the operations in many ways. More Safety: BYOD may have its own set of risks, but if security measures are adopted carefully, then enterprise solutions always help to increase the safety quotient. Secure communication via the VPN or the remote wipe will eventually lead to more safety. The utilization of Enterprise Mobility solutions in business allows the company to boost the work efficiencies within the company. The employees make use of the mobility solutions to improve the overall productivity of the organization. And, a plenty of benefits of using enterprise mobility solutions lead to the most promising of them all: more growth and revenue. Therefore, more and more organizations are interested in adopting enterprise mobility solutions.